My satchel arrived in under two weeks. 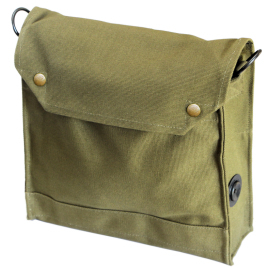 The color is awesome, Other Satchel repros are often a dark green canvas, and shrink with distressing methods, as well as not having the correct metal disc and the divider in the main pocket. Originals often wreak of old stale moldy canvas, and washing them can make them shrink or fall apart. Magnoli's satchel solves all those problems. It's new, has a beautiful brown antique look to the canvas, the correct snaps, disc, and divider in the main pocket. Of all my bags it is my new favorite, and at my side almost every day!